Thank you for visiting our CBH page. Please check out our FAQ documents. If you still have questions or concerns about the proposed project after reviewing the material here, please feel free to e-mail the UPCRC by clicking on the mail link at the top of the page. Check back often as we continue to add information. The proposed location of the Boathouse is on the North end of Founders Landing (see map below), set back from the beach. It would house equipment for the UPCRC, the NMU Crew Club, and anyone interested in storing their human-powered watercraft. Marquette is very proud to have over a half-dozen city beaches, which are open to the public for residents and visitors alike to enjoy. The Founders Landing beach will remain open to the public, just as it is today. With public storage of human-powered watercraft and an ADA-accessible dock offered, the Founders Landing cove would serve as a safe launching area for those looking to paddle and row beautiful Lake Superior. Who is the Upper Peninsula Community Rowing Club? The UPCRC is an all-volunteer, 501(c)3 non-profit organization dedicated to teaching the art of rowing to youth and adults in the Marquette community. The UPCRC provides all equipment and training to its members who pass the safety requirements. We are very proud of the fact that some of our graduating youth have gone on to have winning collegiate rowing success. Why does the CBH need to be East of Lakeshore Blvd.? Rowing equipment is unique in that it is long, heavy and fragile. The boats are carried from their storage location and placed directly into the water. To carry a 60-foot, 200 pound, fragile boat across roads, sidewalks, and bikepaths could put equipment, rowers, pedestrians, motorists, and bicyclists at risk of damage or injury. Why is Founders Landing the best location? Rowing is a "calm water" sport with specialized and expensive equipment. Due to the large size of the boats, they require a lot of space to maneuver (in and out of the water), and due to their low height in the water, require calm water that is free of waves, motorboat wake, and heavy boating congestion. The Founders Landing location best fits the unique criteria for a successful rowing program. Will the proposed boathouse building obstruct the lake view? No. The proposed design of the building is below grade, and much of it will be underground. The building will have a flat, living “green” roof, with no obstruction of the lake view, and would be open to the public as an observation deck and picnic area. Will access to the beach be decreased? No. The public will be able to continue using the beach as they do today. The building will be constructed below-grade and underground, set back from the shoreline. In fact, access to the beach could be enhanced with a path leading to the universally accessible dock. Who will pay for the facility? The UPCRC will conduct a capital campaign to raise the funds for the entire project, and any future maintenance. Is the space you currently use free of charge? Why would you go through all the work to build something? The UPCRC rents our current space at Founders Landing based on fair-market per-foot cost, and leases the clubhouse, under the observation deck, at the current going rate. The UPCRC envisions the space next to the Hampton Inn as an area for the public to use as they do today, a public launch area for human-powered watercraft, barrier-free access for people with limited mobility to enjoy the lake and recreate on it, and to protect equipment from damaging weather. Why is the footprint of the building so big? Rowing is a unique sport with very large equipment. The largest boats are 60 feet long. Currently the NMU Crew team and the UPCRC have six 60-foot boats, five 40-foot boats, two 30-foot boats, and two 20-foot boats. There are also three 12-foot chase boats. The building is designed to house this equipment, while being set back from the shoreline so that the public can still use the beach. Will the public get to use the boathouse? The public is encouraged to visit during open hours. Everyone could enjoy 24/7 access to the living “green” observation roof, public indoor/outdoor kayak/canoe storage, public universally accessible launch dock, and convenient access to the beach. Rowing equipment is expensive and very fragile, and will be securely stored. 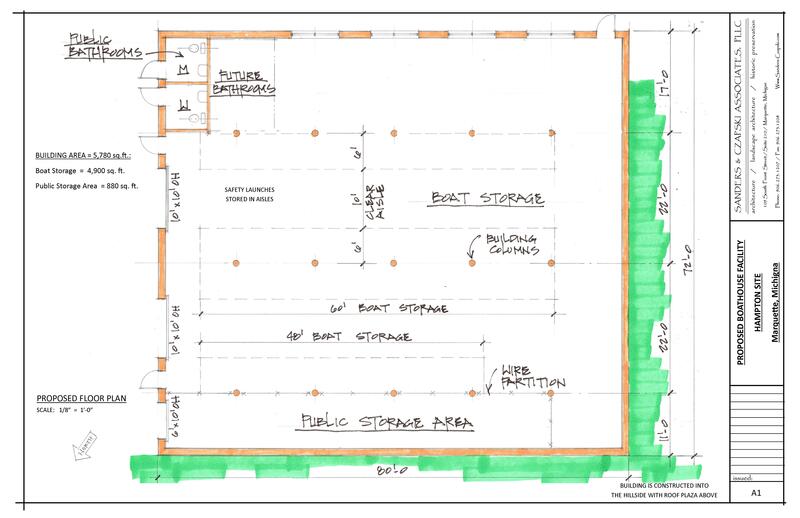 Secure shell rental space will also be available to the public. Will there be a dock? Yes. When our project is complete, kayakers and canoers will be able to comfortably launch their watercraft from the dock. People with limited mobility will also be able to enter and launch their watercraft from this universally accessible dock. There will be a dock for the rowing shells, which will be removed during the off-season. The rowing club is facilitating a partnership with the City (landowner) and the community (funding) to build a grade level public observation deck with below-grade non-motorized watercraft storage adjacent to the existing bike path just south of the Hampton Inn. For many years, this area has been used as a base of operations for the public rowing program at the same time as a public beach. This would not change. The proposed changes tuck the equipment out of view while providing better lakeside viewing and waterfront access amenities for the general public. The opposition wants you to think this is a private, members-only clubhouse. But it’s not. It’s a Community Boathouse with allocated secure storage space inside and outside for watercraft belonging to members and non-members alike. Members pay for equipment and training, non-members can pay for indoor and outdoor human-powered watercraft storage. Neither membership nor payment is required to use the universally accessible public observation deck, outdoor patio, seven additional parking spaces, restrooms, walkways, or launch dock; all of which is provided to the public as part of this project. If you are a person that depends on a wheelchair or other mobility assistance device, you can’t currently access this beach. When our project is complete, people with limited mobility can enjoy the lake from the rooftop observation deck or from the outdoor patio that is accessible from the bike path. They can roll down to the water’s edge on the beach mat path, or even enter their watercraft from the universally accessible launch dock. The opposition won’t tell you that the rowing club is a non-profit organization that provides public recreation through its entirely volunteer-based staff. This program provides the ONLY opportunity among Upper Peninsula coastal communities for high school students and adults of all ages and genders to participate in group rowing. Participants pay annual dues which gives them access to rowing equipment, training, safety protection, and the organized group rows which are offered multiple times every day. The organization offers scholarships for those who can’t afford participation, and subsidizes the NMU crew by paying the US Rowing membership so they can compete. What is being given away? Nothing. The site remains in City ownership, as do all planned improvements―at no cost to the City. What is the cost of the lease? In addition to getting the funds to construct the building, the community rowing organization has agreed to pay for all maintenance and repairs for property improvements during the term of the lease, so there are no legacy costs to the City taxpayers. On our plans, you will see the public patio is described as “porous paving”. But it certainly doesn’t mean the same thing as a parking lot – this environmentally sensitive material functions more like a brick patio without the cracks, allowing water to penetrate the ground, but people with limited mobility will be able to enjoy beach-level access. "Over several years our clubs [NMU and UPCRC] have discussed the potential and benefits of a shared facility, and it would be great to se it become a reality. 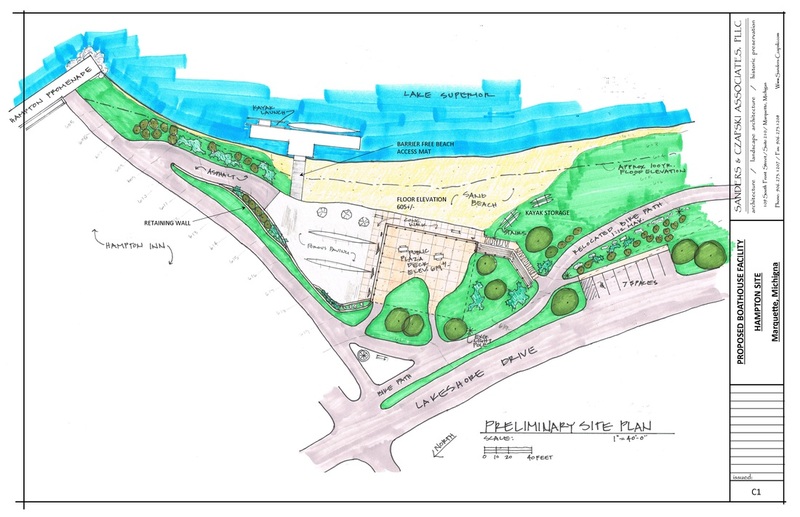 The venue proposed for the boathouse and floating dock provides the protected waters that we need. it is separated from the busy lower harbor area, which makes the launch experience safer for all boaters." Having been raised in Marquette, I returned to live here because of the city's unique attractions. Like so many others, I spend hours walking the bike path along the lake shore, enjoying the views and the atmosphere. The variety of boats on our waterfront surpasses any other city I know. Where else can you see ore boats, tall ships, cruise boats, sail boats, motor boats, jet skis, kayaks, canoes, stand up paddle and — rowing shells? This is part of what makes Marquette exciting and attractive. I am disturbed that those who oppose the rowing club's proposed boathouse are showing a little respect for long, arduous and very public process that took place prior to the lease. In viewing websites from both sides of the issue, I see a city owned building on city owned property that increases access to the waterfront for the public and provides handicap access that is not otherwise available. The opposition's claim that the rowing club is being given a free lease seems ridiculous since the rowing club is offering to raise $600,000 in funds to build and maintain the structure. To me, that sounds like a sweet gift to Marquette taxpayers. The opposition's website uses the words "private" and "members only", yet the rowing club's president (The Mining Journal, Dec. 3) says that the facility will not be reserved solely for members of the rowing club and the club's website says "the Founders Landing beach will remain open to the public, just as it is today. As residents of a city that is proud of its waterfront, we should support the rowing club's proposal to improve the section of the shoreline that is already being used to launch their boats. -Write a letter of support to the Mining Journal editor. -Write to your City Commissioners with your support. -Download our informational flyer. Post it and pass it on! I find myself in agreement with the recent letters written supporting the decision of the Marquette City Commission to work with the rowing club to develop a boathouse and launching site for the use of the club and with access provided for non-rowing citizens. I have followed the project and discussions about it and feel that there has been adequate input from many on both sides of the issue, in-depth explorations of options, and much thought from the commissioners before their commitment to the project. I find the oppositions arguments to be contradictory and a ballot proposal for a citizen vote on the issue unnecessary in this instance. Although not a rower/sculler, myself, I do value water-related activities, spend a good deal of time along the bike path and agree with Mr. Peterson's recent comment saying that seeing a variety of boating activities happening along our shore is one of many attractions which lures people to visit Marquette and to live here. The design of the boathouse and viewing area seem to me to be an attractive addition to that portion of the shoreline and will not take away from the lovely views we have there. The rowing club has given every indication of its commitment of time and resources to make the boathouse a community asset. I support the city's decision to work with them. ﻿Copyright © 2014-2016 Upper Peninsula Community Rowing Club. All rights reserved.